Australia has been isolated for thousands of years and thus plants have been able to develop independently to suit the often harsh natural conditions. Due to the wide range of different environments and plant communities, the native flora of Australia is the most diverse and varied in the world, growing in tropical, rainforest, stony inland deserts, alpine meadows and sandy heathlands. 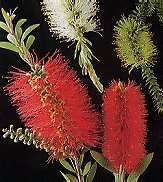 It has been estimated there are about 20,000 to 25,000 different plants native to Australia. The largest family of flowering plants with over 1000 varieties, the Myrtaceae (myrtles). Possibly the best known and widely grown of Australian shrubs. Hardy with tough leaves, often with paper bark. Flowers are produced in dense spikes at the end of the branches. The stamens are the most conspicuous part of the flower and are in colours of green, yellow, white and various shades of red and violet. They vary in size from 5 foot shrubs to small trees. The Flannel Flower, belonging to the carrot family, commonly found on the coastal sandstone country of New South Wales and Queensland. Flowers in spring and summer. The Red and Green Kangaroo Paw, the plant grows to 2 feet, the flowers on stems up to 4 feet. The floral emblem of Western Australia. 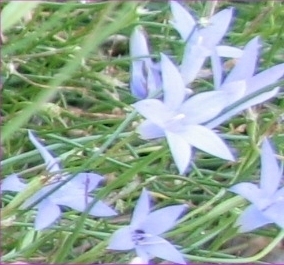 A small perennial herb with violet blue flowers up to 2-3cm in diameter. The flowers may be erect or nodding and are carried on long slender stems. Flowering time is normally from October to March. The floral emblem of the Australian Capital Territory. Flowering time peaks around late winter. It is the floral emblem of the Northern Territory. The Sturts Desert Pea is a trailing plant, a creeping annual, with bright red flowers, up to 10cm long, carried in clusters on short erect stems. Stalks and leaves are clad in silky grey hairs. The floral emblem of South Australia. Found mainly on the coastal plains and tablelands of the State of New South Wales. There are four kinds of waratah, one of which grows into a tree. These shrubs and trees have tough, dark green leaves, often toothed edged. The waratah is really hundreds of individual flowers crowded together into a dense head. The bright crimson petals are really modified leaves called bracts. They flower from September to November in rocky and sandy soils from the Blue Mountains of New South Wales to the north in Queensland. The floral emblem of New South Wales. Australia's official national floral emblem, featured on the coat-of-arms. Possibly the best known amongst the Australian plants. With 600 or more kinds of wattles, they can be found in every part of the country, from well-watered areas to the arid Centre to the cold mountain regions. They are usually the first to appear after bush-fires. They can be found growing in the most remote areas, from low, spreading shrubs to large, upright growing trees. The individual flowers are always very small and massed together in pom-pom heads or rod-like spikes. 1st September is Australia's Wattle Day. Whilst most wattles are spring-flowering, there are some that bloom all year round. Shown here is the Long-leaf Wax Flower (Eristemon myoporoides). There are about forty species of waxflowers, having five petals and five sepals. The petals spread in a star-like pattern and they are usually a shade of pink to almost white. They grow along the east coast of Australia.